The work package ‘Systemic governance practices’ aims to critically assess how history, facilitation, stake-holding and reflexivity contribute to water governance under conditions of climate change. It is possible to use the example of watersheds, or river catchments and coastal estuaries, to help understand how social and biophysical phenomena mutually influence each other over time. Water governance is becoming an increasingly important issue at the same time as several others that are linked to it, including climate change adaptation, energy and food security and biodiversity conservation. Effective governance needs to link up these diverse areas of policy in order to enhance and maintain the quality of biophysical and social processes in which water plays a central role. New challenges demand new ways of thinking and acting, and we can think of water or river catchments as a type of theatre in which new and different types of performance have to be developed to meet present and future needs. This work package proposes a new framing for managing water, one that recognizes that human social systems and biophysical systems are coupled in a mutually influencing co-evolutionary dynamic. The two systems co-evolve over time and mutually influence one another – a process known as ‘structural coupling’. 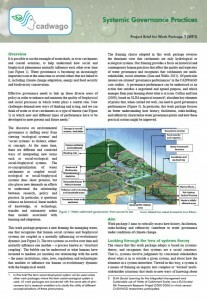 The framing choice adopted in this work package reverses the dominant view that catchments are only hydrological or ecological systems. Our framing provides a focus on historical and contemporary human practices that affect the quality and trajectory of water governance and recognizes that catchments are multistakeholder, social situations. This work package is led by OU, United Kingdom. Main contacts are Prof. Ray Ison (ray.ison-at-open.ac.uk), Dr. Chris Blackmore, Dr. Kevin Collins and Dr. Kate Lonsdale. More information is available in the Project brief.